Sitting atop one of the largest pockets of magma found anywhere in the world, Yellowstone has the terrifying potential to literally end it. The pocket is constantly under a tremendous amount of pressure, evident by the insane amount of geothermal activity found all across the park. If this pocket were to erupt, if would annihilate a large portion of North America almost instantly, after which the plume of dust and ash would cover the world in an event similar to that which exstinguished the dinosaurs. The scary part is, this could happen at any time, scientists are constantly monitoring the park for seismic activity, hoping to get a warning if the largest potential time bomb in the hemisphere decides to start counting down. Thankfully, there’s currently no evidence that it will go nova anytime soon, and its position atop this gigantic pot of boiling rock only makes the terrain that much more spectacular. As you approach the park, really from any direction, you will begin to notice the foothills of the Tetons cropping up against the horizon. Soon, you will find yourself buried amongst the sloping hills, covered in pines of all ages. Every so often you can see where there has been a recent forest fire, the fresh young pines popping up from the ash, the charred remains of their predecessors still strewn across the ground. We chose to enter from the North, and worked our way through the gradually increasing foothills towards the mammoth hot springs, one of the main attractions to be found in Yellowstone. The hot springs cover a sizable portion of the northern area, culminating in a forty minute hike around the hot spring terraces; a collection of boiled steps rising some five hundred feet into the sky, baked to a dead ashen white in most areas, with the active portions showing a bright golden orange as the minerals from deep within the earth are deposited all along the cascades. A light rippling effect covers the massive steps as a thin layer of water runs down their coarse and grainy surface, the smell of sulfur hangs in the air and steam can be seen dancing atop the falls where the wellsprings are found. As you climb the wooden scaffolding that clings to the side of the terraces, the heat begins to increase noticeably. When we entered the park, it was a chilly forty degrees, by the time we reached the top, it was veritably balmy, the entire area covered in wafting steam and small geysers. If you do decide to trek all the way to the top, you will be rewarded with sights similar to those found in the bacteria pools near the western entrance. Shallow ponds of prismatic liquid, the water radiating out across the spectrum, filled with vivid blues, oranges, greens, and the occasional purple. Almost neon in the glaring sun, the pools are the source of the terraces, the bubbling springs providing an ample supply of sulfur to coat the hills beneath in glistening fashion. Steam rises off the top of the water, only to be whipped about frantically as the winds that roll off the Tetons crash over the peak of the terraces, hitting you with gusts of refreshing cool coupled with the rather unpleasant stench which covers the area. Be warned however, Yellowstone is by far one of the most popular attractions anywhere in our country, and it fills up FAST. If you want a place to park, at any attraction, you need to get there very early unless you’re prepared for an incredibly lengthy hike from point to point. 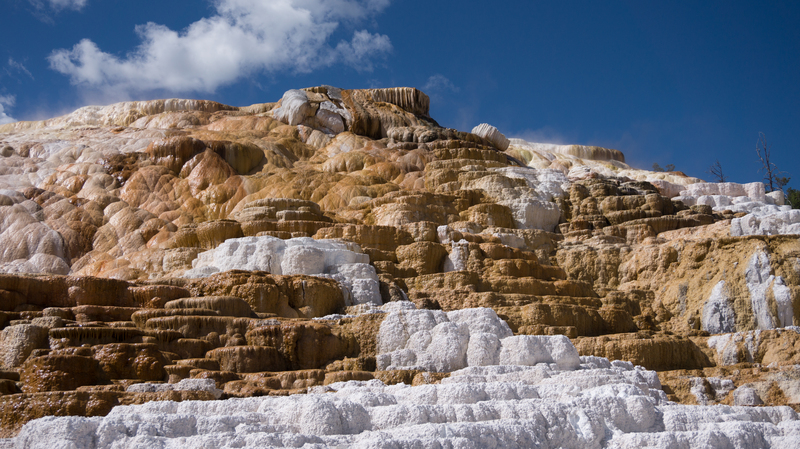 The key areas to avoid if you want to stay away from the crushing mass of tourists are the mammoth hot springs, the bacteria pools, and of course old faithful. Even then, as you travel the roads you should expect a significant amount of stoppage all throughout the park. Whenever wildlife is spotted just off the road, which happens quite frequently, the worst rubber necking in the world will follow. Not only will everyone slow down to look, but a good majority will attempt to park right in the road to get out for a closer view, causing total grid lock and often ending with disasterous results. We saw two accidents in a single day in the park, one of which looked potentially fatal. An SUV had become impatient and attempted to pass on a two way road, only to end up getting completely obliterated by a full sized tour bus coming the opposite direction. It’s also good to keep in mind that Yellowstone is visited by people the world over, and there is a huge number of foreign drivers on the road, not used to driving in America let alone a national park. 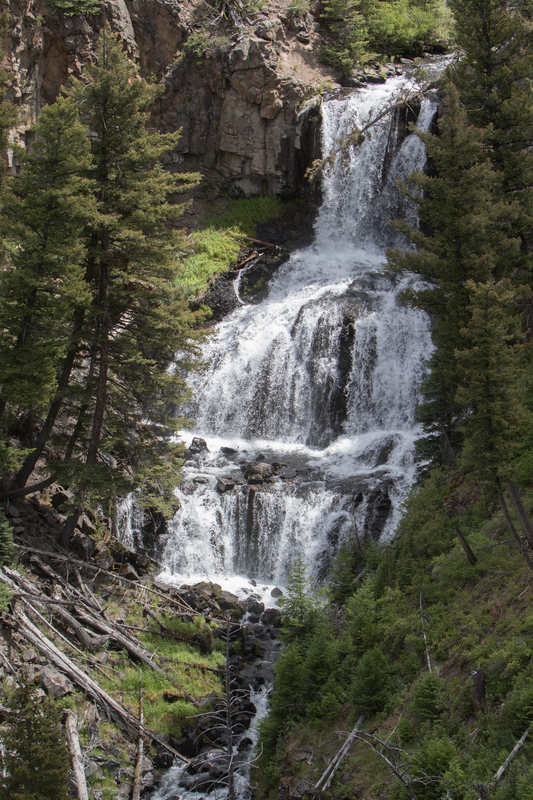 Driving the park can be an amazing experience, but if you start to get impatient just remember that nothing puts a damper on a vacation like your engine block ending up an inch away from you. As we left the terraces, we decided on the recommendation of a ranger to take the road east towards tower junction, then south towards the lake, passing by Mt. Washburn on what was promised to be the most scenic route in the park. It was. As you climb some seven thousand feet into the sky, the vistas become more and more breathtaking with each turn, to the point where we were both plastered to the windows, unable to say anything other than “wow” and “Oh. My. God.” A constant array of pull offs dot the road, allowing for relatively consistent flow of traffic, not to mention ample opportunity to take in the sights. The view is indescribable, and pictures don’t even come close to doing it justice. 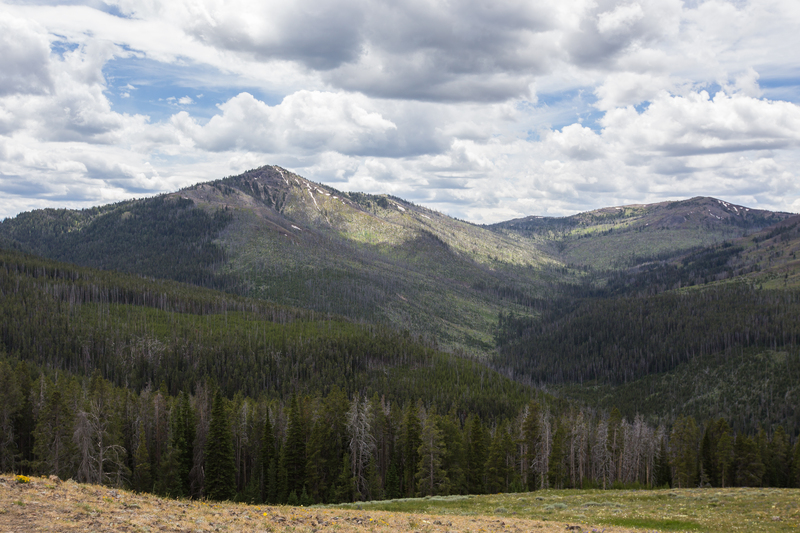 You can see for miles out into the valleys of the Tetons, the rolling plains swooping in and out between the mountains, meeting the tree line that forms a shifting barrier between the soft green of the valleys and the harsh snowy peaks above. Idyllic doesn’t even touch it, I kept expecting to see Julie Andrews spinning around somewhere far beneath us, captivating a herd of bison. As we neared the top, the temperature had dropped to near freezing, and the wind was enough to make walking a serious exertion. If you see anything in the park, make sure this drive is on the list, it’s truly the journey of a lifetime. 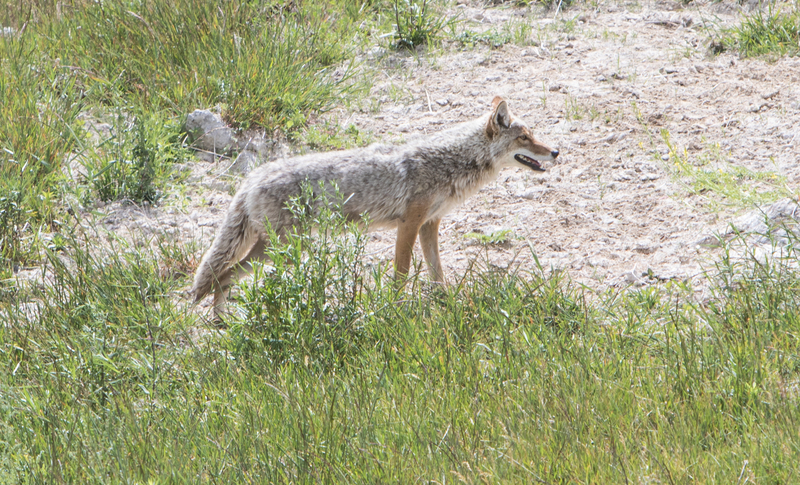 All throughout our journey in the park we encountered wildlife, even just from the road. 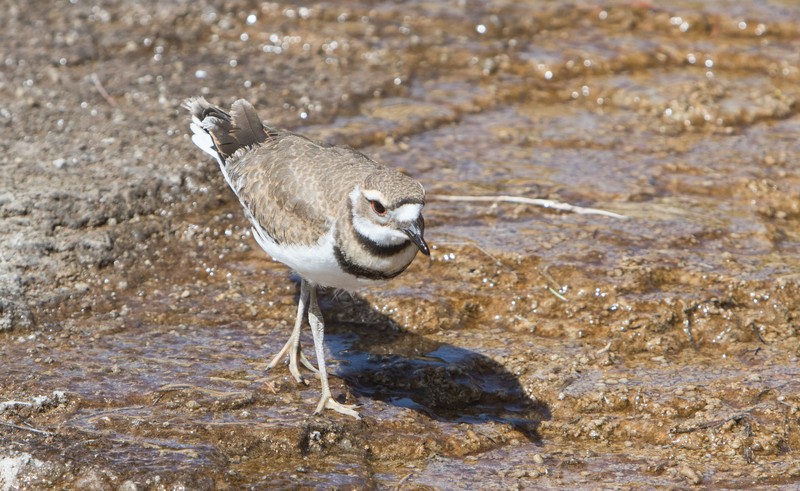 Your best chance at seeing them is of course off on the trails, but most species here are so numerous that a days worth of driving will yield multiple sightings with no trouble at all. The best indicator for where road sightings are taking place is of course the stoppage mentioned earlier. Whenever you see a line of brake lights ahead, be prepared to watch for whatever has decided to meander into view of traffic. 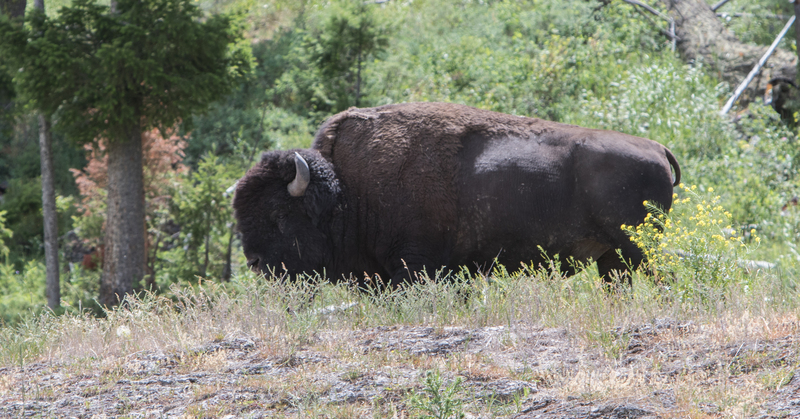 Most typically it’s buffalo, which roam the park freely and can be seen alone, or in herds, all throughout. Just driving through we saw at least twenty in the span of only a few hours, not to mention a coyote and various flocks of river birds. Bears can also be found in the park, but sightings are rare and they mostly keep to themselves. Still though, if you plan to go on any long hikes, make sure to read up on the proper precautions, and steer well clear of any cubs. 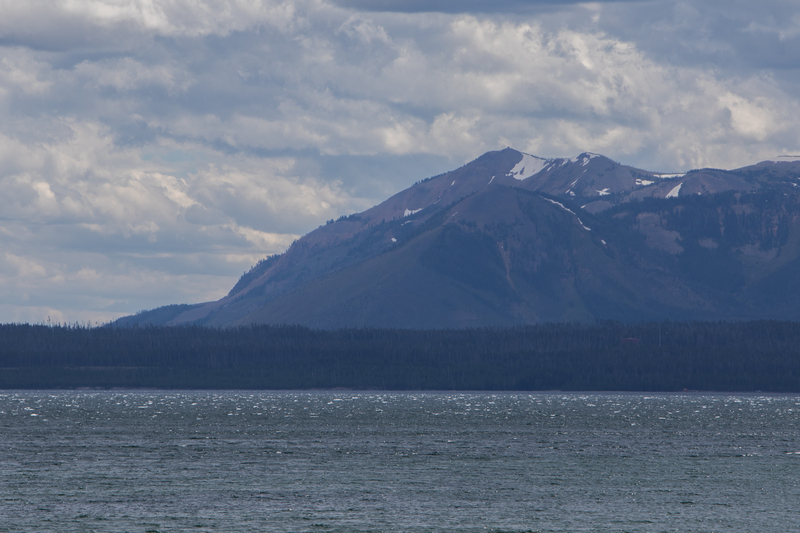 After a solid three hours of driving, we made it to Yellowstone Lake, a gigantic body of water which rests amongst the mountains and is populated by a wide array of islands, some forested, others just rocky stumps sticking out of the water. The wind coming down from the mountains rips through the area, creating waves some three to four feet tall, the kind you might expect from Lake Superior, but never have I seen waves like these from a lake this size. The water was terrifically violent, and the mountain backdrop created the most untamed sense of wilderness, it almost felt out of place amongst the peaceful grandeur harbored to the North. That being said Yellowstone is nothing if not an area of truly awesome power, it’s hidden savagery only peaking out in the form of its many geothermal hot spots and geysers. It’s a strange dichotomy, but a key part of what makes this place so special, and so treasured. I could go on for hours talking about Yellowstone, but like so many of the National Parks, words and pictures can only go so far, and the only true way to experience it is to actually experience it. Even with a full day spent in the park, we only managed to see the smallest fraction of what it has to offer, to really see it could take a lifetime, but it would be a lifetime well spent. Simply being there makes you feel more a part of nature than anything else, and it has more to offer than maybe any other park in the country. Hundreds and hundreds of miles of trails, countless spots for camping, opportunities for fishing, picnicking, and the entire area is one giant sightseeing adventure. The only way you could enter the park and not see something amazing would be if you walked in with your eyes sewn shut, and even then the sounds and smells would paint a picture you would never forget. I can’t express how gratifying it was to make it back to Yellowstone, to do it right, to find our redmeption, but now I just feel like I need to back even more. Now that I know what’s out there, what I’m missing, the drive to return has only gotten stronger, and I’m sure I’ll give in before too long.